PRAYER PROMPT ••• Sometimes, when we really need encouragement, a good friend might offer to stand with us. Whether it’s a trip to the doctor for an uncertain diagnosis or (on the other end of the spectrum) a close friend standing up as a maid of honor or best man at a wedding — it’s comforting to know we are not alone. In the church world, we often speak of God being with us. 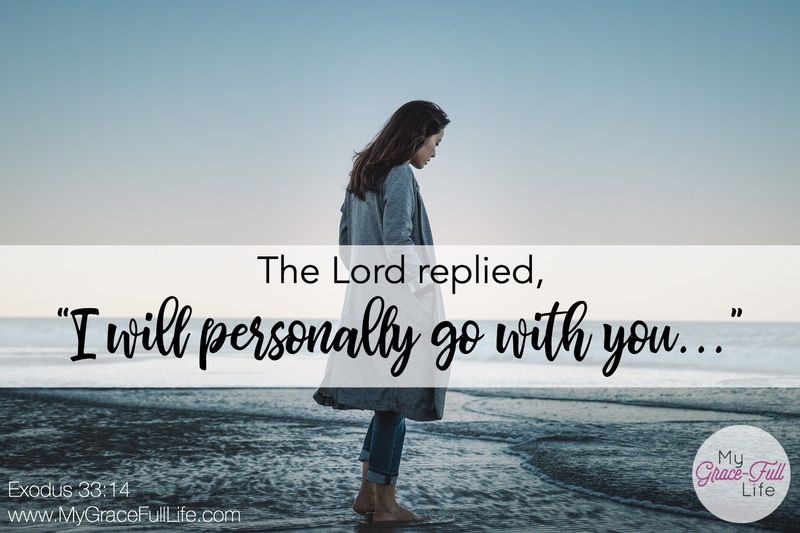 I love the poem, “Footprints in the Sand,” as it’s a great reminder that wherever we go, God walks with us, and sometimes, He even carries us. It’s a promise God made to Moses, and it’s a promise He extends to us. This is one of those verse-mapping moments! This isn’t the only time God has promised to be there. Doesn’t that give you such great hope and encouragement? In every moment – both the highs and the lows – if we’ve given our lives to Jesus, God is with us. His Holy Spirit lives within us (Acts 2:38)! I know sometimes, it may be hard to discern His presence. But the Bible promises that if we draw near to Him, He will come close to us (James 4:8 and Jeremiah 29:12-14). As we draw near to God and seek His will above our own, His presence becomes more and more obvious. Isn’t it a wonderful feeling that no matter what, we always have a friend in Jesus who will stand beside us? Today, as you pray, thank Jesus for His incredible promise to be with us forever. Thank Him for giving us the way to spend eternity with Him. Ask the Holy Spirit to help you seek Him and His will, and invite Him to have a dominant place in your life so that you can feel His presence in all situations. So grateful that Christ is always with me!! Thank you for this wonderful reminder! Previous Previous post: 1.3.18 Prayer Prompt: Can We Bring God Joy?